Our heart beats for testing surfaces, especially for coating thickness measurement. In this area, we are one of the world's leading manufacturers and look back on a long and successful history. Our products are exclusively made in Germany. Thanks to the production at our location in Neuss, you benefit from the best quality "made in Germany". PHYNIX - your expert for surfaces. Coated materials and components are everywhere. Coatings meet functional requirements such as corrosion protection or are used for decorative purposes. Whether varnishing, galvanic layer or multilayer layer structure - a non-destructive coating thickness measurement is needed in nearly all industries. From the plane car paint to the optimally coated screw: Exact coating thickness measurement with PHNYIX gauges ensures perfect results and high customer satisfaction, without damaging the measuring object. Test of the delivered material in the goods receipt department. Does the material meet the expected requirements? Is it suitable for the upcoming production process? During production: alignment between the production instructions and the real production process. For a perfect result during production manufacturing steps can be adjusted. Quality assurance with PHYNIX coating thickness measuring instruments ensures optimal product quality of finished goods. There are several methods which determine the layer thickness. In practice, two measurement methods are widely used for coating thickness measurement, which do not damage either the surface or the underlying individual layers: the magnetic method according to DIN EN ISO 2178 and the eddy current method according to DIN EN ISO 2360. The base material and the layer to be measured determine the respective method. The magnet method or the magnet-inductive method is used for the coating thickness measurement of nonmagnetic layers on magnetic base material. It is thus suitable for the measurement of lacquers, enamel and plastic on iron or steel. The eddy current method is used to determine the coating thickness of non-conductive basic materials on nonmagnetic material. This method is suitable for measurement layers like lacquers, rubber, plastic as well as ceramics on aluminum, copper, brass or zinc die casting. Both surface measurement techniques have the great advantage that they determine the coating thickness non-destructive. In contrast to other methods such as the peeling method, they do not damage the surface of the object. The magnetic induction method and eddy current methods differ in their mode of operation. In the magnet method, low-frequency alternating current, a magnet coil and a measuring coil are used. The layer thickness measuring device evaluates the measured winding voltage electronically and displays the exact value digitally. In the eddy current method, high-frequency alternating current flows through a coil and produces an eddy current that affects the coil inductance. The PHYNIX coating thickness measuring devices process the measured inductance and display the layer thickness on their displays. 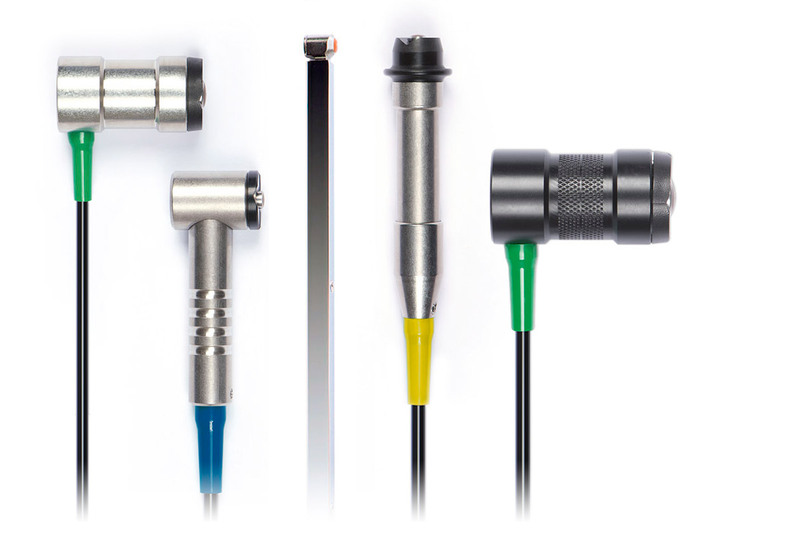 Combination probes combine the different modes of operation and are thus versatile. Both measuring methods require an undisturbed course of the magnetic field lines. However, this is not the case with curved surfaces or at edges. The coating thickness measurement on soft or rough surfaces can cause difficulties. A calibration of the measuring device is necessary for these special measuring tasks. PHYNIX's high-quality PHYNIX coating thickness gauges are adjusted in the factory in such a way that they precisely measure and display the coating thickness of a flat surface - a calibration is not necessary. In the case of the above-specified special measurement tasks, a calibration is unavoidable, since otherwise the measurement results would be not accurate. For an optimum setting of the coating thickness gauge there are different calibration methods available: one-point calibration, two-point calibration and two-foil calibration ensure precise coating thickness measurement. 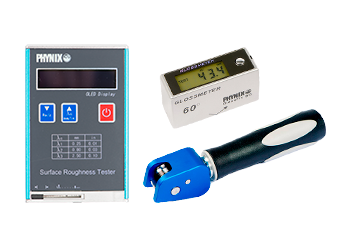 In addition to our coating thickness gauges, our portfolio also includes products for surface measurement: from porosity detection and hardness testing through gloss measurement and cross-hatch cutting as well as wall thickness and roughness measurement - the surface measuring devices from PHYNIX meet the highest quality standards. We are looking forward seeing you there ! New Phynix dealer in Estonia - UTM Shipping Service Ltd. in Tallinn. New PHYNIX importer in Switzerland - Innotest AG from Eschlikon. Under the trade name ®Savecoat, Innotest develops and sells, among other things, an innovative, contactless, air ultrasound-based coating thickness gauge line. Cookies help us to run this website. By using this website you agree that we are using cookies for tracking and improvement.